Have you heard of oil pulling, also known as “cavalier” or “gundusha”? It’s an ancient Ayurvedic dental technique that involves swishing a tablespoon of oil in your mouth on an empty stomach for about 20 minutes. This action can draw out toxins in your body, primarily to improve oral health, but also to improve your overall health. After much research, I have finally decided to try it. I thought it might motivate me to do the oil pulling each morning if I made some nifty oil-pulling chews. Instead of measuring the oil and adding essential oil to it, all I will have to do is simply get a chew out of the refrigerator! 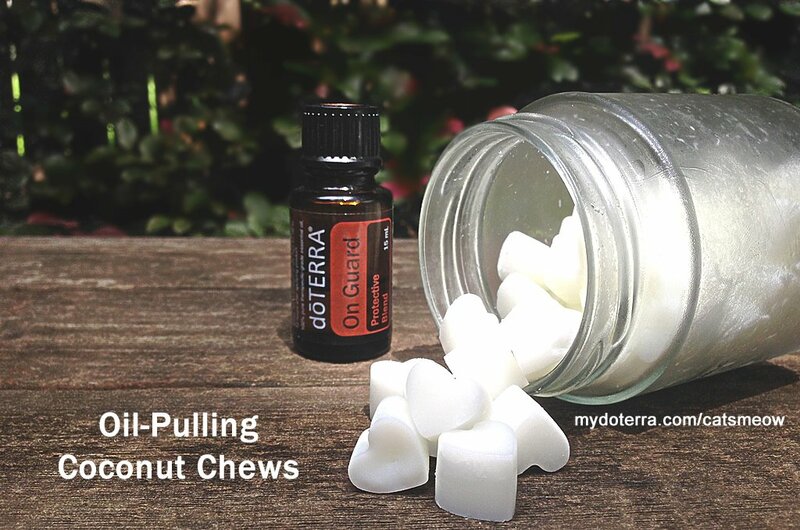 The recipe is below if you wish to try oil pulling with these handy, dandy chews. I purchased a silicon heart mold (purchase here) that makes 55 chews that are approximately 1/3 teaspoon in size. Two chews seem to be the perfect size for oil pulling. You will need coconut oil, Protective Blend essential oil and a silicon mold. 40 drops Protective Blend (to help fight outside threats) – Contact me to purchase this oil blend! Put the coconut oil in a double boiler on the stove over low heat. Once the coconut oil is mostly melted, take the bowl of the double boiler off the heat and stir until melted. Add 40 drops of Protective Blend essential oil to the coconut oil and transfer mixture into a glass measuring cup to make it easier to pour into the mold. Before pouring into the mold, make sure you have something sturdy under the mold otherwise you will not be able to transfer it to the freezer. (I used a small cutting board.) Place in freezer for about 30 minutes to harden the chews. Once the chews have hardened, pop them out of the mold by pushing from the backside of each heart. They pop out quite easily. Store in the refrigerator. Each morning, place 1-2 chews in your mouth. Once melted, swish around your teeth and gums for 20 minutes on an empty stomach. Be sure to spit the coconut oil in a trash can as it could harden and clog your drain over time. Note: the amounts specified above are specific to the mold I used. Please leave comments below to let me know the results you are having with the chews or if you have any questions! Contact me to purchase essential oils and to find out which essential oil company I recommend! I have tried oil pulling in the past but had to quit because I simply cannot stand the taste of coconut at all. Can I use a different oil, or is there a flavorless coconut oil I can use instead? For the best tasteless option in coconut oil, try a refined version such as expeller-pressed coconut oil. Expeller-pressed coconut oils are deodorized and therefore have a very bland, mild scent and flavor, making them tasteless or almost tasteless. 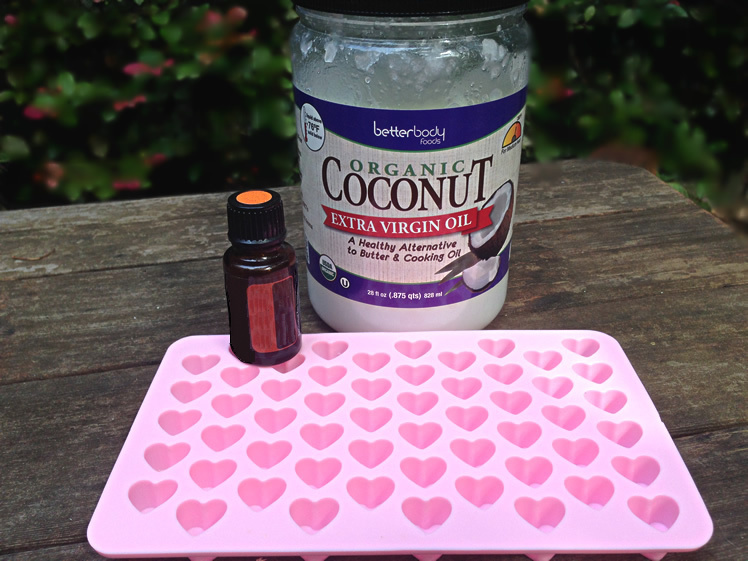 This makes expeller-pressed coconut oil perfect for those who do not want strongly flavored oils. Expeller-pressed coconut oil will act and can be used the same way as any other coconut oil, but will not have a strong coconut taste. Hope this helps!